We want to help you celebrate the New Year in style! As 2017 looms ahead, this 70s classic is making a comeback. From its humble beginnings as a bar snack in Wisconsin taverns, 2016 was proclaimed to be Year of the Cheese Balls. We have a feeling, however, that you didn’t get your fill of this cheesy wonder. That’s why we propose the following: celebrate the dawn of 2017 by not only watching the ball drop, but feasting on one as well. 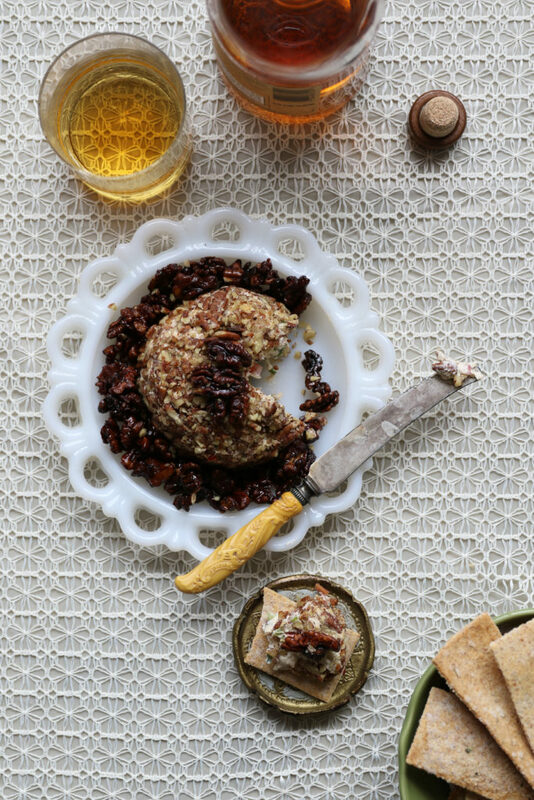 While cheese balls can run the gamut, from sweet to tangy blue to Southwestern inspired, we chose a classic 70s inspired recipe: Nutty, sharp, and with a hint of spice, this cheese ball will wow, whatever your New Years plans may be. In a medium bowl, combine Cream Cheese and grated English Cheddar. Mix in lemon juice, garlic powder, hot pepper sauce, green bell pepper, scallions and salt until well combined. Form mixture into a ball and refrigerate for 30 min. Roll chilled ball in chopped pecans. Optional to refrigerate after, prior to serving. Serve with Sea Salt & Olive Oil Z Crackers. Thanksgiving is one of our favorite times of year. What a perfect holiday for cooks and cheese lovers. The autumnal bounty! The no-holds-barred fall feasting! There is so much to be thankful for. Perhaps you’ve already been mulling over the menu for weeks. There are pies to bake, potatoes to mash, turkeys to carve…and cheese plates to be assembled. We’re busy sourcing and selling our favorite cheese, charcuterie, chocolate, jam and other good things, so that your holiday table can be a happy, tasty place. We’re also cooking and baking like crazy. Do you know our awesome Executive Chef Amy Stonionis? You should. Amy grew up in a small town in Pennsylvania foraging, hunting, fishing, pickling, butchering and cooking her heart out. She’s lived in Brooklyn since 2007. When Amy is in the kitchen, you can rest assured you’re going to eat very, very well. 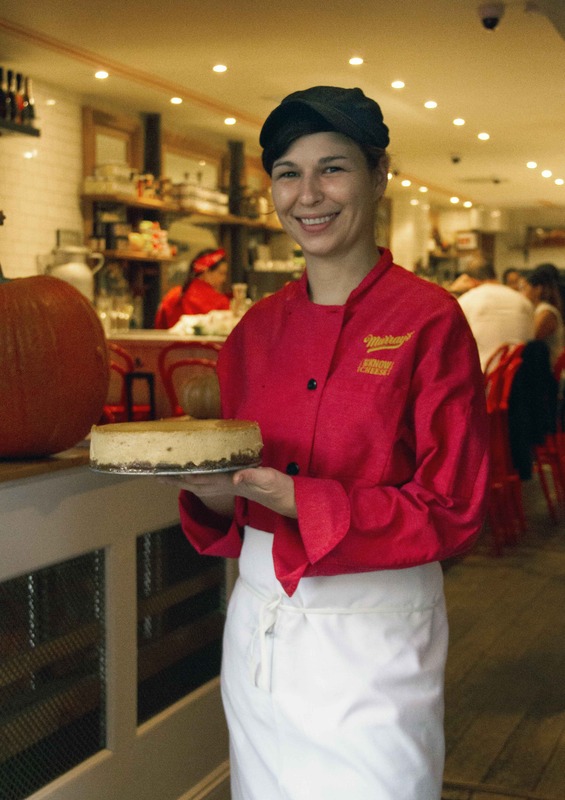 When Amy generously presented us with her light yet lusciously rich cheesecake,we gobbled it up in mere moments. It’s hard to control yourself when faced with this sweet, perfectly spiced goodness. Here’s the recipe. We hope you make it and share it. Happy Thanksgiving from our family to yours! To make the filling, cube and toss the pumpkin with olive oil, 1 tbsp sugar and cinnamon and roast in a 350 degree oven until tender, about 15-20 minutes. Combine cream cheese, the remaining sugar, eggs, vanilla and heavy cream in a stand mixer. Add roasted pumpkin and mix until pumpkin is fully integrated into the wet ingredients. In a separate bowl, combine melted butter with crushed graham crackers, cinnamon, and brown sugar. Pack crust in bottom of a springform pan and top with pumpkin filling. Bake at 275 degrees for 90 minutes. In our search for the elixir of life—AKA the perfect mac and cheese—we’ve tasted many-a recipe, and to paraphrase those Brooklyn bards, the Beastie Boys, we’ve been “working harder than ever, and you can call it macking.” At long last, our cheese alchemy has led us to THE ONE: a recipe we can’t keep secret, a dish so perfectly balanced and proportioned we must share it with you immediately! 2. Cut a slit into the halved onion and place a bay leaf in the slit. Stick the 2 cloves into the onion. Placing the milk in a saucepan over medium low heat and add the onion. 3. In a separate saucepan, make a Mornay sauce: melt 5 tablespoons butter and add the grated garlic. Slowly add the flour, whisking to combine, and cook for 2 minutes. Remove the onion from the warm milk and discard. Ladle in the warm milk to the butter and flour mixture (called a “roux”), whisking constantly, until combined and smooth. Add the nutmeg, black pepper, and cayenne pepper. Add 5 ounces Fontina Val d’Aosta and 5 ounces Spring Brook Reading. Then add 3 ounces Comte St. Antoine and whisk until well combined. 4. In a large pot, bring water to a boil and add salt. Add the macaroni and cook until al dente. Strain the macaroni and place into a bowl. Add the remaining grated cheeses and toss to combine. 5. Pour the Mornay sauce over the macaroni and toss to combine. In a small sauté pan, melt 3 tablespoons butter and add the Panko breadcrumbs, thyme, and lemon zest. 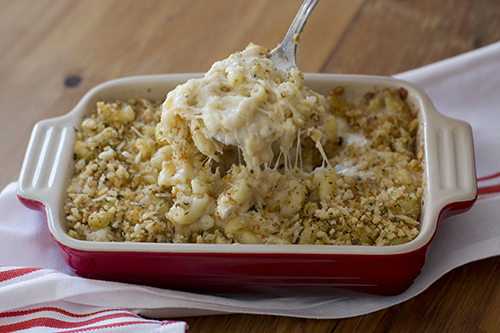 Place the combined macaroni and cheese into a shallow baking dish and top with the breadcrumbs. Bake for 20 minutes and serve right away. Not in the mood to cook? 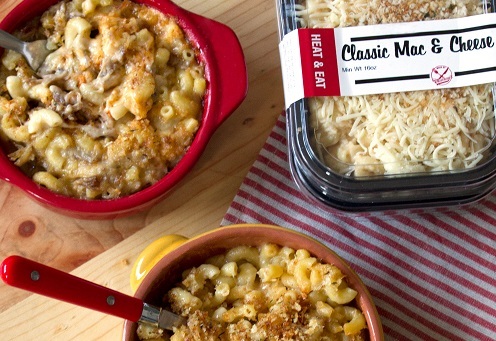 Check out our prepared mac and cheese, which comes in three insanely delicious flavors: classic plain, basil artichoke, and pulled pork. We’ll deliver dinner straight to your door…all you need to do it heat it in the oven and enjoy. Click here to shop Murray’s prepared mac and cheese. 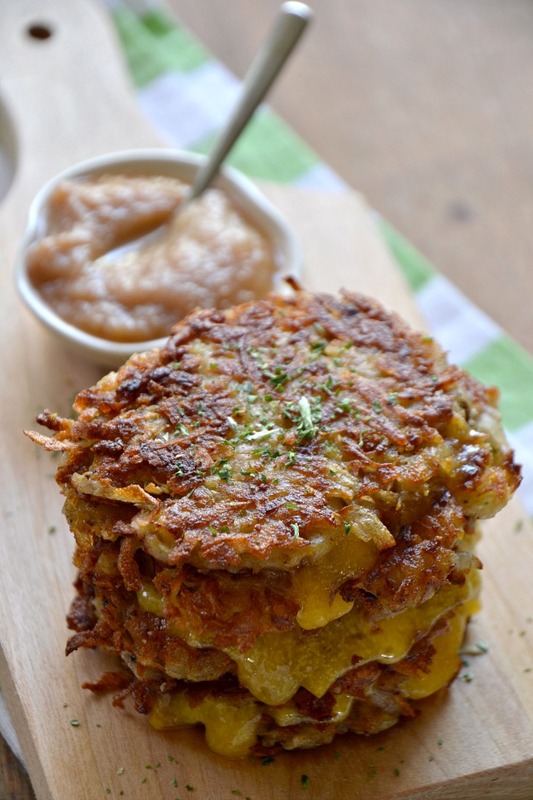 Latke Grilled Cheese? Yes, Please! Here’s a recipe we’re definitely making this week, which we’ve outright copied from The Nosher. Line a large bowl with a kitchen towel and line a baking sheet with two layers of paper towels. Peel and grate the potatoes and place them in the towel then squeeze out all of the liquid from the potatoes. Discard the liquid then place the dried potatoes in the bowl. Stir in the egg, bread crumbs, salt and pepper until combined. In a heavy saucepan, heat 1 tablespoon of butter and 1 tablespoon of olive oil over medium-low heat. To test if the oil/butter mixture is hot enough, drop a small piece of the potato mixture into the pan and if bubbles form around the edges, the oil is ready. Carefully place two ¼ cup-sized scoops of the potato mixture in the pan and cook for two minutes, until the latkes are browning on the bottom. 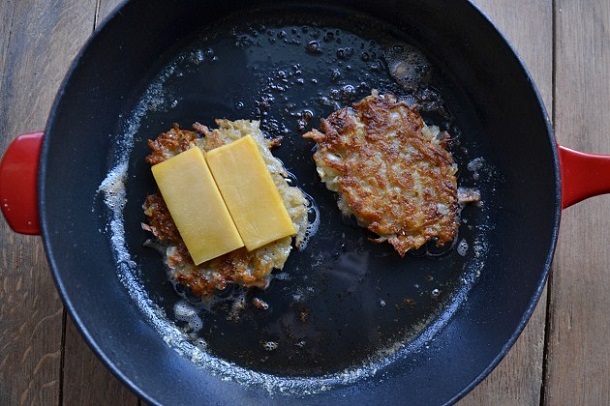 Flip the latkes over carefully with a spatula and place 1-2 slices of cheddar cheese on one latke. Cook for one more minute then place the second latke on top of the cheese and press down. Cook for 30 seconds then flip over the grilled cheese latke sandwich, press down and cook for 30 more seconds. Place the hot grilled cheese latkes on the paper towels to drain then repeat this process to make 3-4 more sandwiches. 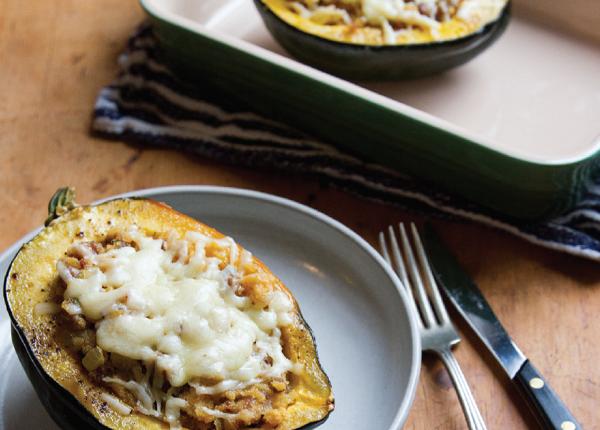 Stuffed squash is a classic Fall dish that beautifully highlights the flavors of the season. The sweet and nutty qualities of Acorn squash mesh perfectly with the nuttiness found in Gruyère. Whether you’re whipping up a batch for a Thanksgiving feast, or simply looking for an easy fall dinner, this recipe will make you fall in love with Fall! No meat? No problem! Vegetarians will be thankful to learn that this dish is also super tasty without the sausage. 1. Preheat oven to 350ËšF. 2. Rub squash halves with 2 tablespoons olive oil and season with salt and pepper. Place squash cut side down on an oven-safe baking sheet and roast for 20 to 30 minutes or until tender. 3. While squash is cooking, add 2 tablespoons olive oil to a sauté pan and brown onions over med-low heat. Add sausage and brown. 4. Drain fat from the onion-sausage mixture. Mix sage, breadcrumbs, and egg into the mixture. 5. Remove cooked squash from oven and fill with sausage mixture. Top with grated Gruyère cheese and bake for 10 mins until cheese is browned.